As a substitute for a missing or lost tooth it is hard to beat a dental implant for realism and authenticity. Dental implants are the only dental replacement that restores the whole tooth from crown to root and as a result is the sturdiest restoration available. There are many reasons for losing a tooth ranging from accidental damage to gum disease but whatever the cause it can be a very painful and upsetting experience at any age. If a tooth has been knocked out or extracted due to decay it can be the cause of further dental complications causing pain and anxiety so it is always recommended by dentists to replace teeth as soon as possible. If a gap is left in the dental arc then it can cause the other teeth to move or rotate. This can lead to complications with bite and also increases the likelihood of further dental infection. Human bones require stimulation to maintain their size and density; if you don’t use them, you lose them.You must understand that each tooth has a specific job, and the loss of even just one, can seriously impair your bite and chewing capacity.So, when a tooth is lost or removed, the underlying bone is no longer stimulated by the pressure from chewing, which is crucial for maintaining your mouth healthy and the bone strong.A dental implant provides this stimulation, and helps maintain the bone’s integrity, because it works like a real tooth.The sooner you get a dental implant after losing a tooth, the more likely the bone will remain intact. When we are young, everything is in place, and that’s why we look so good.Our teeth and jawbone support our facial features, keeping them in place; thus, when we lose a tooth, our face begins to transform, because things are shifting under our skin.Dental implants assist in slowing down this degenerative process and can even restore the missing structures.When you are able to smile and laugh without reservations, and eat anything you like, your morale, wellbeing and self-image improve dramatically. Many older people use removable partials and/or full dentures that are bulky, difficult to wear, frequently come loose, and very often cause embarrassment as well as some difficulty when speaking. 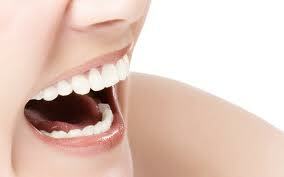 To the contrary, dental implants are like real teeth, freeing one of all these inconveniences. As soon as you stop exercising a muscle, it gets smaller, and there are numerous muscles underneath the skin of your face. Around 90% of normal dental implants are 100% successful, typically lasting twenty years or more. Due to ordinary wear and dental decay, traditional dental bridges last between five and ten years, and eventually must be replaced; however, dental implants are free of decay because they are made out of titanium. In the dental arch, there is a place and function for every tooth, and when one is removed, the others start moving because of the lack of pressure from the missing tooth.This can cause bite problems as well as the loosening of teeth, which then can lead to abnormal stresses and periodontal disease. 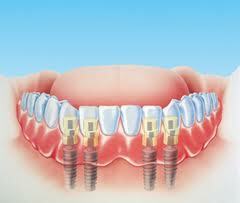 Finally, the result is more tooth loss.Dental implants can act as bookends, securing spaces where teeth are missing. A smile is worth a thousand words… but when your teeth are not healthy, it can really affect your self-image.Dental implants can replace any missing tooth, helping preserve the bone that is needed to support full and beautiful lips. 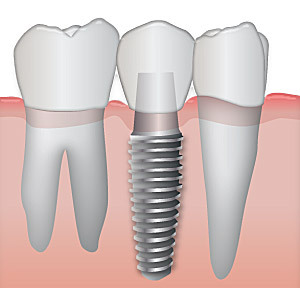 In fact, one of the most important uses of implants is to prevent bone loss in the front of your mouth. Teeth help you feel things in your mouth; you are aware when you bite on a tooth, but when it is removed, it is like cutting a limb off. You are unable to properly feel what you are chewing.While dental implants are not teeth, they do function as such, by putting pressure on the jawbone in a way similar to natural teeth; thus, offering the natural sensations expected when chewing. Dental implants last longer than typical removable dentures, are much more comfortable, and provide a dramatically better quality of life for the person receiving them.